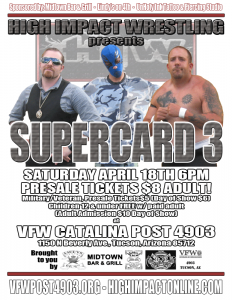 HIW returns with it’s second installment of the SUPERCARD premier events series at VFW Catalina Post 4903! SUPERCARD 3 will be an all-out wrestling extravaganza at this beautiful, indoor venue. Presale Tickets are just $8 for adults and $5 Military or Veterans, with Children 12 & under FREE with a paid adult/military/veteran admission! Contact us on our Facebook page – High Impact Wrestling (HIW), or contact us by e-mail here – http://highimpactonline.com/contact/ to purchase Presale Tickets! Day of Show Tickets are priced at $10 for adults and $6 Military or Veterans, with Children 12 & under FREE with a paid adult/military/veteran admission! Due to building occupancy restrictions purchasing Presale Tickets is strongly advised. Information about this event will be available here or on this event’s Facebook page at http://www.facebook.com/events/545033965638542/. An official press release, including the lineup, can be found here – http://highimpactonline.com/?p=1050. As always parental discretion is advised. Doors open at 5:00pm and the show starts at 6:00pm! Don’t miss this one! *The address is listed as 5320 E. Bellevue St., Tucson AZ 85712 on Google Maps. Both addresses – 1150 N Beverly Ave, Tucson, AZ 85712 and 5320 E. Bellevue St., Tucson AZ 85712 point to the same building.